A huge turquoise ring. The turquoise oval measures 30mm x 20mm. It is set on a hammered silver cuff ring in an 18ct yellow gold setting with gold wire and bead decoration. 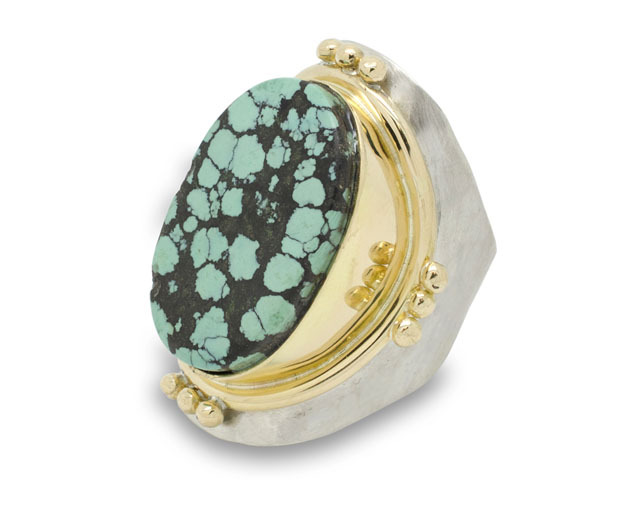 If you love your turquoise it just about the most stunning dress ring around. This particular ring was made to commission using a piece of turquoise supplied by the client sourced in India. If you would like to commission something similar then give our designers a call. Call Rebecca on 01273 846338.